It can be challenging to decide what to do, after losing a tooth. Fortunately, there are several options available. The first and easiest option is to leave the empty space where the tooth was removed. While this may be the least expensive option, it can result in unsightly gaps and spaces between teeth, and can also make chewing more difficult. In addition, adjacent or opposing teeth may sometimes drift into the empty space, causing bite or gum problems. If, like most people you decide to replace the missing tooth, replacement options are available . Keep reading to learn more about the three methods of tooth replacement—dentures, bridges and implants. With a dental implant, there is no need to grind down the healthy adjacent teeth. The implant provides the support for the crown. 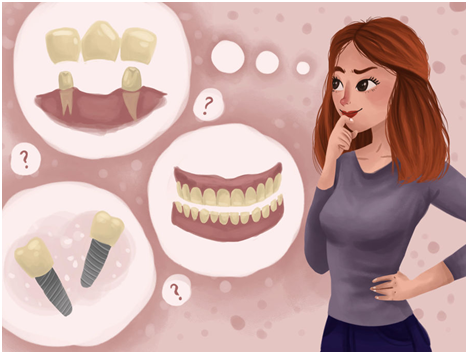 If you are having missing teeth and your gums and jaws are healthy, you may benefit from dental implants, which are artificial teeth that are implanted surgically into the jawbone. With good oral hygiene, dental implants can last for a lifetime.Dental implants are often a popular choice for people who have only one or two teeth missing, but they can be an alternative to dentures if you have several missing teeth. Another tooth replacement method is a fixed bridge, which is a restoration that fills the space where one or more teeth have been lost. A bridge uses natural teeth adjacent to the empty space, to support false tooth/teeth between them. The natural teeth need to be shaved or contoured, so that a crown (cap) can be placed over top. These are called the abutment teeth. The crowns on each tooth support the false tooth in between are known as the pontic tooth. The fixed bridge is cemented into the missing place and can only be removed by a dentist. Bridges are excellent solutions if the adjacent teeth already require crowns for some unrelated reasons (e.g. large fillings that are at risk of fracture or adjacent teeth that are already Root canal treated and need to be capped. Placing a bridge is normally a multi-visit process. During your first visit, your dentist will prepare the teeth on each side of the gap and take an impression of your teeth (and the space).This impression is then sent to a dental lab, where lab technicians will make the bridge out of ceramic, metal, glass-ceramics or a combination of these materials. Your dentist will fix a temporary bridge to protect your exposed teeth while your permanent bridge is being made. During your follow up visit, the bridge is fitted, adjusted and cemented into place. However a Dental bridge has its own drawback. Dentures are false removable teeth that are relatively quick and easy to fabricate. They can be partial, where only one or a few teeth are replaced, or complete, where all the teeth are missing in the jaw and are replaced. A partial denture holds false teeth on a plastic or metal framework. The framework is removable, and is designed to fit around the adjacent teeth. It may cover part of the gum tissue or roof of mouth. There may be hooks and rests to help hold the framework; these can sometimes be visible when smiling. Once you’re missing teeth are replaced, eating should become a much more pleasant experience. And since missing teeth can cause difficulties with speaking, removable partial dentures may help you to speak clearer. Removable partial dentures can be a bit difficult to become accustomed to. Putting them in and taking them out takes practice and it may be a few weeks before they stop feeling tight or uncomfortable. 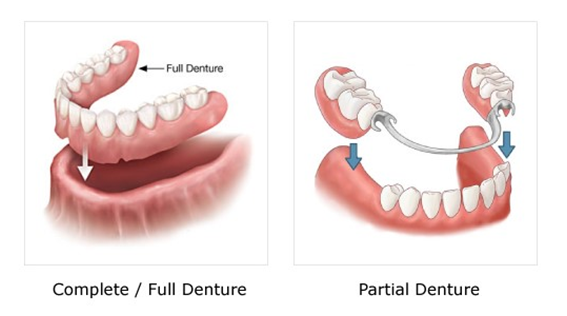 Another disadvantage is that in due course, as you age and your mouth changes, your removable partial dentures may no longer fit well and could break or one of the teeth could loosen. Ultimately, the option that is chosen to replace missing teeth depends on many factors including your concerns, finances, and goals for treatment. A frank discussion between yourself, your dentist, and with a dental specialist, will help you to determine which treatment is the right one for you.